Home » Chennai » Dressed Up Dessert! After dinner (that I forgot to photograph as usual) at a fancy South Indian restaurant recently, I was tickled to have a humble Ragi Manni – a blacmange like sweet, indigenous to my hometown and made with finger millet flour, jaggery and water – served up in style! I doubt very many other Indians have heard of this sweet! 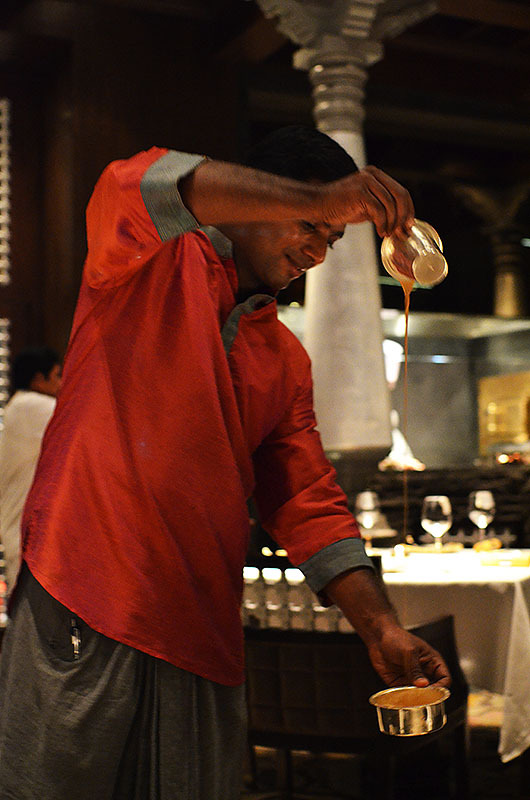 The meal ended with fragrant South Indian Kapi (coffee) served in the traditional way. The piping hot liquid was first cooled by pouring it rapidly and in a series of arcs between two tumblers, before being placed in front of us. Perfection! 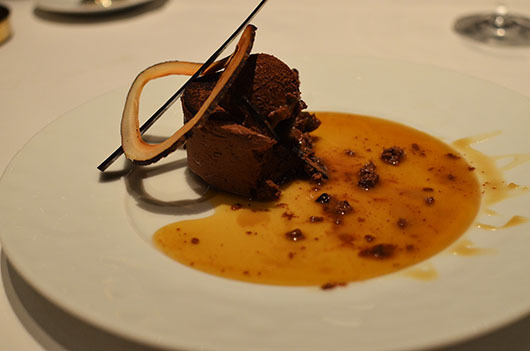 I couldn’t possibly pass up an opportunity to talk about dessert, with a food theme could I 🙂 Don’t forget to check out the other foodie entries for Ailsa’s Travel theme – Food. I have decided to return just for the desserts and coffee 🙂 Thanks again for dropping by. I think I could just eat dessert and be happy the rest of the day! Works of art! Wow the humble manni gets a new avatar.. what was it served with and where is this ? Especially considering the humble origins of that first dessert 🙂 Thanks Tricia, your Grand Canyon post seems awesome. Will be there to check it out shortly. That coffee is seriously good. Coffee is grown in my home state of Karnataka, but the filter coffee here in Chennai is famous, especially in traditional brahmin homes. Wow – those desserts are really amazing! Wish I could have tasted both of them, Madhu, and the kapi. It wasn’t so much the skill of the plating, as much as seeing that poor man’s food passing for gourmet dessert in a fancy restaurant that I found amusing. First thought, “why would anyone pay fancy prices just for that garnish?” 🙂 Yes the Kapi was the true highlight. Is coffee called Kapi in SL too? I know it is by the Tamils, but in Sinhala as well? Sort of like Kophi, in Sinhala! Ahihihi… Restaurants do seem more friendly with customers with camera. I had the same special treatment when I dined at an African restaurant. I love sophisticatedly prepared desert, but only from time to time, or when I’m in a cultured place. In America, I just go for quantity. Now I want one of those desserts for breakfast. 😉 They both look wonderful, Madhu. It looked too beautiful to eat! …this is torture! Joking! Perfection indeed! is it just me,or does everyone here have that mouth-watering feeling?! You wouldn’t eat Ragi Manni if it was served to you plain, believe me 🙂 Underlines the importance of visual appeal! Sometimes the line between food and art is very thin. Love the photos…it looks delicious. Eye-popping dessert photos. The first looks like it might contain caramel. Does it? That’s one of my favorites. That and chocolate. The dessert itself was made with Jaggery or unrefined brown sugar (cane or palm) It was drizzled with caramel syrup though. Now I have a huge sweet tooth and this dessert looks amazing!!! I LOVE Indian food. I love all the spices. It is so delicious. Wish I could send you some authentic Indian 🙂 Thanks Nicole. We have a lot of Indians living in Minneapolis as there is an excellent job market. However, the Indian restaurants I believe are spiced down for the “spice-less” Americans! I’ve found great Indian in Chicago when I lived there. I really adore Indian food….it is amazing!!!! You tormenting woman! What is jaggery? I want that chocolate thing now! and which area of India has this divine food? Jaggery is unrefined cane sugar. And the first dessert is a poor man’s sweet in the villages near Mangalore in South India. ‘Ragi’ is traditionally cooked with milk and used as baby food as well. 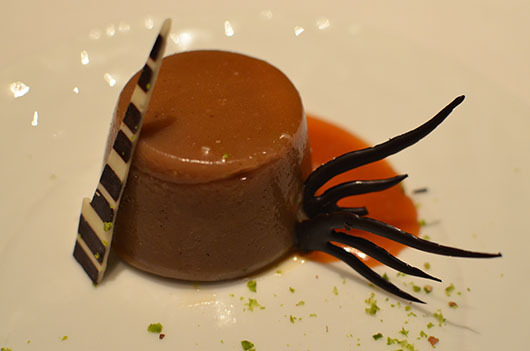 Couldn’t resist smiling at “Chocolate Poornam Mousse”… Interesting indeed! Yeah, but the combination worked 🙂 Thanks Kasturika. The dessert looks great and I love the picture of the man pouring the coffee. those desserts are lil treats..!!! but being a south indian myself i never heard of this Raagi Manni..??? That would depend on which side of the Vindhyas you are from 🙂 Ragi Manni is indigenous to Mangalore on the West coast. Are you from Tamilnadu? Yeah, that would about describe these 😀 Thanks Anne!